No one wants paper clutter, but you also want to feel comfortable with the papers you get rid of instead of worrying that you'll need them again later. 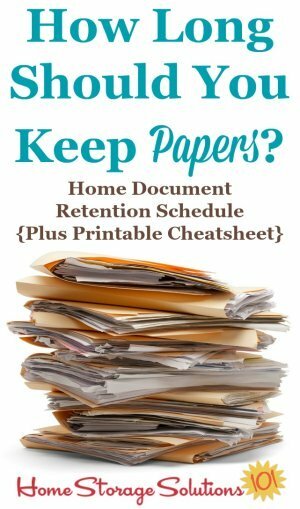 To help with that I've researched how long you should keep papers of all varieties, and then provided this printable home document retention schedule cheatsheet that you can reference as needed. I've broken down this list into the most common types of paper you might consider keeping, or that you most likely already have in your filing cabinet or file box. The article itself provides a bit more nuance and explanation than I could put into the single printable cheatsheet, so make sure to read everything here in the article to completely understand, and then you can get your copy of the printable below, by scrolling down to the bottom of the page. Please note that when I say you can declutter things after a certain number of years, you may not want to just throw these items in the trash. Consider shredding them if they are one of the 15 types of documents that should be shredded, so you don't reveal personally identifiable information. In addition, these same guidelines can be helpful when trying to determine when to get rid of certain emails or files on your computer. This becomes more and more relevant as more information is provided in digital form instead of on paper. If you, for example, get your bank statements digitally instead on paper, the information below is just as relevant for determining when you can get rid of the digital file as the paper version. This article provides general rules, but especially as it relates to tax documents you should always consult with your tax professional regarding any unique circumstances you may have. Further, this articles focuses on documentation that is typically found in the home, personally, and is not a business article. Therefore, always check with your tax professional to understand what business records you should be keeping for tax purposes, and for what time period. Finally, this articles focuses on general United States tax rules, and not those of any other country. Keep tax returns and the supporting documentation (which includes worksheets, receipts and other documents which support the amounts you put into the return) for seven years. The IRS has a 3 years to audit most federal returns (from the date of filing), but there are exceptions for these statutes of limitation which expand the time frame to six years in some instances of gross underpayment, and to indefinite when there is fraud or failure to file a return. 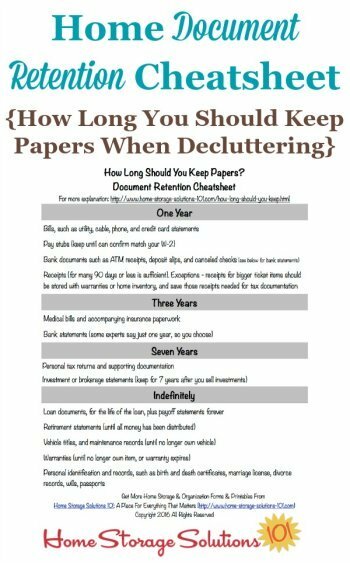 The general consensus is to keep your personal returns for 7 years, keeping 7 file folders, one for each year, and then shredding the oldest of those returns once you add the new year's return to the file. However, there are instances when you may need to refer back to even older returns, such as if you own a home, have a non-deductible IRA contribution, or have rental or business property that you are depreciating over several years. Therefore, I suggest you always, as part of the tax preparation process for your taxes, confer with your tax professional asking them how long you need to keep various returns and documentation, and follow their advice since your situation may be unique. You can read more about organizing tax documents here. There's really no reason to keep owner's manuals, period, these days, as long as you confirm you can find the manual on the manufacturer's website (which is often the case). 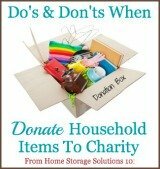 However, if you do decide to keep them you only need them as long as you have the item they go with. After you've gotten rid of that item then get rid of the manual. Warranties should be kept with the proof of purchase of the product (such as the receipt) stapled to it. You need to keep these warranties until you no longer own the product or until the warranty expires. You can get more information about organizing both warranties and owners manuals here. Receipts are tricky, because they really fall into so many categories. For everyday types of purchases you don't need to keep receipts long at all. If you feel you want to return something, typically that time period is around 90 days (all store policies differ and vary) so after 90 days is a good time to throw away (or shred) most receipts. That 90 day period would also give you time to reconcile the receipts versus the credit card or other statements that come in to confirm no mistakes have accidentally been made. In addition, some receipts are also important for tax documentation, even for items that would otherwise seem typical and common place, like a receipt from a restaurant, if it was on a business trip for instance. If you need the receipt to document a number that you place on your tax returns then follow the rules not for receipts, which can typically be kept for shorter time periods, and instead follow the rules above for how long to keep tax back up documentation. You can read more about organizing receipts here. You should keep bank statements at least one year, and some financial experts suggest three years instead, so you decide for yourself which of those time frames you will use, considering whether you can get older statements from your bank online, for example. The financial expert that suggested three years decided that after he, himself, was audited and wished he'd had some of the older documents. For other bank receipts and documents, beside the statements, such as ATM receipts, deposit slips, etc. you only need to keep these until you have time to reconcile them to your most recent bank statement to make sure no error has occurred. Cancelled checks should be treated similar to receipts, in that mainly you don't need them, but there could be exceptions in regard to warranties (for proof of purchase), large ticket items to show value for insurance, or as needed for back up tax documentation. Most bill stubs don't need to be kept long term, especially once you've confirmed based on the next bill that your previous month's bill payment was properly credited. However, sometimes payment disputes arise a few months later, so as long as you have enough room in your file drawers (and you should once you properly declutter) I personally suggest keeping old bills for about a year or a bit longer. To make it easier I suggest keeping two 12 pocket expanding file folders for paid bill stubs, with one of the twelve pockets designated for each month, and then purging old bills regularly using the system described in the article for organizing paid bill stubs and statements here. Also, please note that some bills are treated like receipts and used for tax documentation, and those need to be kept long term as explained above with the tax document section. Credit card statements can also be kept for approximately one year, or even less, once you've confirmed the transactions have shown up correctly (this is where you're typically comparing your receipts to the statement each month) and that your previous payment was properly credited . The general exceptions that I keep mentioning above still stand, for when you'd want to keep these credit card statements longer. That is if the statement is neceesary for tax documentation, warranties, or insurance purposes. In addition, if you carry a balance on your credit cards I suggest that you do not get rid of statements after a year, but instead treat them as loan documents, which will be discussed below. Loan documents should be kept much longer, at least until the loan is paid in full. There is no reason to keep pay stubs once you receive your W-2 to confirm the wages stated on it are correct. Once you've got the official tax document, the W-2, or perhaps a 1099, (which you'll keep for the requisite number of years for tax back up documentation listed above), you can get rid of the pay stubs. I've separated medical bills, receipts and related insurance paperwork out into its own category because frankly our healthcare billing system and health insurance payments are so complicated it behooves you to keep many of these items longer than other types of bills. This is especially true when you've got lots of different medical expenses, take any type of medical related deductions or credits on your tax returns, or have had problems with a particular health care provider in the past related to billing. Many of these billing errors don't show up for a while, and then can take months to get resolved as well, which is why I suggest you keep all of these types of documents for three years instead of one like many other types of bills. Loan documents, plus proof of payments for these loans should be kept for the life of the loan. Then, once the loan is paid off you still need to keep the payoff statement forever. Remember that loan documents include things like your mortgage documents for your home or any rental properties you may own, as well as any financing contracts you have, such as for the purchase of a vehicle or other bigger ticket item. Contracts should be kept during the entire term of the contract, and just like with loans, any documentation showing the contract was fulfilled completely to satisfaction should be kept for at least a few more years, as long as your state's statute of limitations for breach of contract. Finally, insurance policies should be kept during the life of the policy, but in addition, remember that people can sue you later and an older insurance policy may provide coverage, especially if it is a term policy, meaning it covers you for liability during a specific term, which could be a term several years ago. It is best to keep all the policy paperwork together, including both proof of payment, as well as the policy terms and any riders all in one spot. Keep all insurance policies, such as for your car, home, umbrella policies, and also things like title insurance indefinitely. They can be moved to longer terms storage after several years or scanned for digital storage so they're not taking up a lot of space in your file cabinet though if you wish. When you purchase a home, and also when you sell a home, there are a lot of tax implications involved. 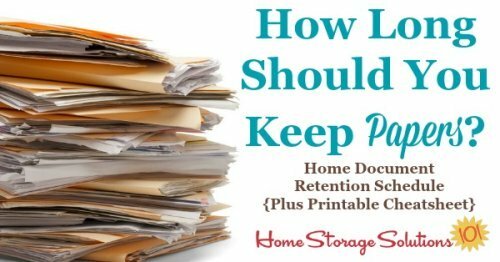 What trips people up when it comes to keeping documentation about their home is that they often live in that home for many years, so some of the documents can seem old and irrelevant now, but when you go to sell the house proving the amount you paid for improvement that occurred several years ago becomes relevant. Therefore, keep all documents related to your home's title, mortgage documents, as well as receipts related to major home improvements together in a file. Your tax accountant will thank you later. Ask your tax professional for more information if you're unsure what types of documentation to keep regarding home ownership for tax purposes. Along with home ownership, car ownership is often a large purchase for us as well. Keep vehicle titles, registration, proof of insurance, and warranty and maintenance records for your vehicles for the life of the vehicle, or until you sell it to someone else. Keep documents related to your retirment accounts indefinitely, until all of the money has been distributed from them. Depending on when your retirement horizon is, this can be a quite a while. This is especially important to do if you've made a nondeductible contribution to an IRA. The reason is that you need to keep the records to prove that you already paid tax on this money when the time comes to withdraw it. For other types of retirement statements you should keep your quarterly statements each year until you get your yearly one, and then you can keep just the yearly summary as long as everything matches up. However, you want to keep, at least, those yearly summaries until you retire and are paid the money, or when you close the account. Many people also have investment or brokerage statements for investments purchased outside a retirement plan. For tax purposes you need to keep all paperwork necessary to show your basis for the investment, including how much you purchased it for, and the date, and then later, how much you sold it for, and on what date. You need to keep all such records for the life of the investment, plus seven years thereafter since this income (or loss) will be reported on your tax returns. If you have investment and brokerage accounts I suggest speaking with your tax professional to confirm you're keeping all the right paperwork. Here's the printable cheatsheet showing the general time frames that you need to keep various types of documents. Place a copy in the front of your filing cabinet, and also another in your household notebook. We're now done with the section of the Paper Organization Series dealing with accumulated paper clutter, and now we're going to begin to focus on building our systems and routines to keep the paper from accumulating so much again in the future. The first thing you've got to do is create a daily routine for organizing paperwork as it comes into your home, and this article will explain how to do this.